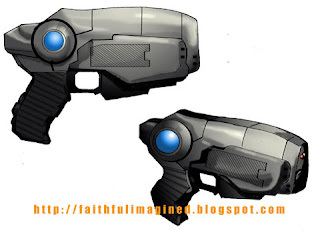 The Templar standard-issue weapon uses legally-sanctioned technology called pulson and fires highly dense kinetic energy pulses. It is commonly referred to as The Peacekeeper, manufactured as a sidearm, a rifle, and a cannon. The Peacekeeper’s various settings are capable of rendering unconsciousness, disrupting electrical fields, bursting organs, or shattering solid matter. Pulson technology is proprietary to Faith. One of the most sacred sites on Aideena, the monastic citadel is dedicated to the science and practice of prophecy and paranormal phenomenon. It is exclusively managed by the Order of the Oracle, and maintains a shrine that attracts pilgrims year round. Traditionally, all women journey to the Temple at least once in their lifetime to commune with the Sisters and receive a blessing (official psychic reading) on location. One of the first monastic citadels of Faith, The Temple is dedicated to fundamental priestly training, rigorous martial discipline and renowned for its traditional approach to Faithâ€™s teachings. The Faithful trained at the facility are almost exclusively intended for service in the Order of the Knights Templar or the clergy. The Disciples of Paul maintain the most notorious and demanding athletic program as part of the Templeâ€™s curriculum. It preserves ancient practices of linking extreme physical endurance with superior mental fortitude. Security Protocol Response (referred interchangeably as channels or bands): The high priority communications domain used by Faith and the Templar. SPR operates independent of the OmniNet communications network. Secured channels provide multi-band hyper-access audio, textual, and/or graphical information.